It’s not easy working religion into fantasy. Actually, that’s the wrong word: I should say “faith.” Anyone can invent a religion: both L. Ron Hubbard and George Lucas have made millions selling their made-up beliefs. But to depict the way faith works for people, the inner process of how belief gives strength, is hard. It always runs the risk of triteness if it’s a fictional belief, or prosletyzing if it’s not. And its very inclusion makes the reader question the author’s motives. 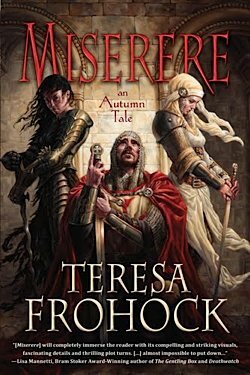 [frame align=”left”] [/frame]Which is what makes Teresa Frohock’s debut novel Miserere: an Autumn Tale that much more remarkable. She creates a cosmology that includes our own world, as well as the alternate reality known as the Woerld. The fallen angels exiled from Heaven want to leave Hell and get their revenge on humanity, but to do so they have to get through the Woerld, a semi-medieval society where children plucked from our reality grow up to be the warriors of their new world. One of those warriors, Lucien, has betrayed both his order and his lover, abandoning her in (literal) Hell to aid his evil twin sister. He sets out to make amends, only to find himself saddled with a ten-year-old girl snatched from earth and fated to be a warrior-exorcist like him. Now he must battle to save her, convince his demon-possessed former love that he’s changed, and prevent his twin from precipitating the final war between Heaven and Hell. As anyone who’s read my Eddie LaCrosse novels can tell, I’m a sucker for the warrior-battling-his-own-failures trope, and Lucien really delivers. He has done some truly ghastly things for all the wrong reasons, and ended up middle-aged, with a bad leg and a positively Wagnerian guilty conscience. Yet he’s held on to a kernel of integrity, and he uses that to start his path to redemption. Rachael, his lover who is now possessed by a low-level demon that’s taking her over bit by bit, is also seeking redemption for her own foolish trust and impulsiveness. And Lindsey, the girl fated to be a warrior-exorcist like Lucien, behaves and acts like a real ten-year-old, with all the strengths and weaknesses that entails. These warriors call on their faith, reciting prayers to work magic. And their faith is unabashedly Christian, although it’s made explicit that in Woerld all religions are represented equally and get along, the exact opposite of how they do here. And I suppose if God made swords glow and the earth open up to swallow enemies on request, faith would be a lot easier for the rest of us, too. But God isn’t like the Force (which, with the advent of midichlorians, seems to be merely the static charge thrown off by viruses rubbing together): faith aids the warriors, but doesn’t do the job for them. And don’t let all this talk of religion put you off, because Miserere is not a book with an agenda. First and foremost it’s a fantasy adventure, with battles and chases and monsters. The extra depth and thoughtfulness Frohock brings to the story is gravy. I was asked to blurb this book, and after I read it, I did so with no reservations. I recommend it whole-heartedly to any fans of my books. Watch for an interview with Teresa Frohock here in the near future. I just started her book last night – and this is out of my usual "genre" so I was going to read it just because I like and respect Teresa – but! from the first paragraph I thought "hey . . . she can write, dagnabit!" and that kept me reading on until I was just too sleepy. A wonderful review for what I can see will be a kick-arse book! Hey, Kat! I'm glad I'm able to keep you up past your bedtime. You've done it enough to me. Thanks!